Utah-based media company Park City People launched a photo report on backcountry skiing the Cardiff Ridge chutes, featuring an extensive photo and video gallery and useful tips and resources. Park City People, a media company specializing in action sports photos and videos, launched a new photo report on backcountry skiing Cardiff Ridge chutes. The article features essential information on the location and access route, the skiing difficulty level, as well as some useful tips for anyone interested in exploring one of Utah’s chute skiing areas. 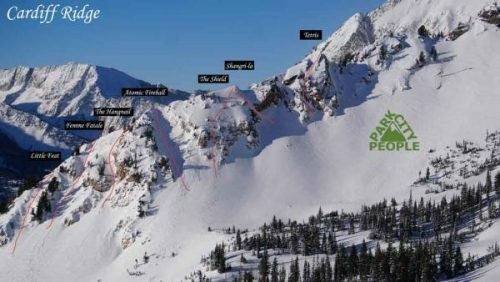 According to the report, backcountry skiing Cardiff Ridge is a good practice area for anyone attempting to ski the lines listed in the book “The Chuting Gallery”. There is a trip report from a previous trip included. The author describes the challenges they faced on their trip and how he overcame them. The report offers useful information on the location of the Cardiff Ridge, providing topographic maps which show the route from the the town of Alta to Cardiff Ridge, and location of the ridge. Information like the elevation and vertical descent of the ski lines are included in the report. Readers will also find an overview of the Cardiff Ridge, which is a difficult to navigate. This ridge requires climbing and technical footwork to cross it. The report also states that the chutes might be best accessed by hiking directly up them. The Park City People report estimates the difficulty level of this ski ascent and descent to be of expert level, due to the high risk of falling, which may lead to injury or death. The report features an extensive photo gallery documenting a full ski trip, as well as a short video.